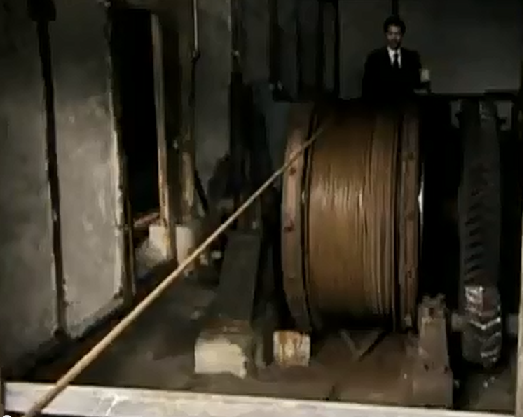 Bamboo cable, comparable to steel in tensile strength was being used at minimum 2000 years ago. Marco Polo described how the Chinese used and manufactured bamboo cables for towing boats. Engineers experimenting for the Whangpoo Conservancy Board found out that these twisted and plaited bamboo cables were made with material taken from the outer layer of the bamboo (which was only 1/8 inch or 3 mm thick). They estimated that the working stress was about 20,000 pounds per square inch, which was of the same order as normally taken by steel wires of the same size. The breakages were very few with bamboo cables. Moreover, while hempen ropes lose some 25 percent of their strength when wet, the tensile strength of plaited bamboo cables increases about 20 percent when they are fully saturated with water. Bamboo cables were available in lengths up to a quarter mile. Bamboo cables were the earliest structural element in the history of engineering to be used for suspension bridges, which originated in western China and the Himalayas. Primitive bridges made of bamboo cables droop across gorges with one end fixed lower than the other. Bamboo tubes greased with yak butter slide down the cables, with a cradle hanging from them in which people and animals side. 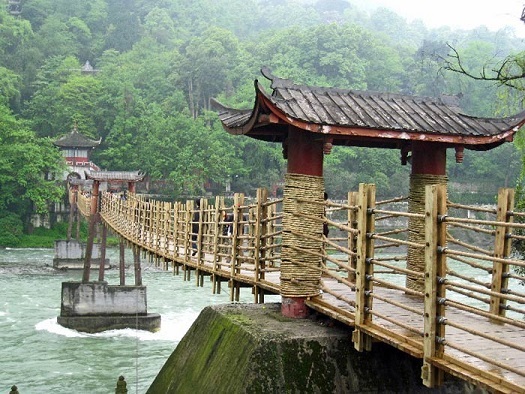 Of great strength, a bamboo cable of 2 inch diameter could support 4 ton, these ancient bridges spanned distances up to 76 meters without central supports. Later on, various designs combined whole bamboo culms, woven slats, and cables braided of workable species such as Gigantochloa apus, which was a favorite for bridges in Java. The remarkable Anlan bridge on the Min River in China was first constructed around 300 AD. Historians consider this bridge one of the engineering marvels of the ancient world. Bamboo cables have a tensile strength of up to 26,000 pounds per square inch, while hemp rope can only carry a stress of 8,000 pounds. The Anlan suspension bridge spans the 1,000-foot wide Min River, is 9 feet wide, and was built entirely of bamboo cables resting on seven supports fixed equidistant in the bed of the stream. The floor of the bridge rested across 10 bamboo cables, each 21 inches in circumference, and five similar cables on each side form the rails. Moreover, the silica-containing outer surface is very resistant to wear, e.g., against rock surfaces, which is naturally important both in towing and bridge cables.